Snitz Edwards was diminutive, energetic, and hilarious. He generally played sidekicks or valet types. He started in films in 1920, in The City of Masks. He later appeared in Ladies Must Live (Paramount, 1921), with Leatrice Joy and Jack Gilbert. He received a rave notice in the Variety Film Review (as a bit character actor). He supported Mary Pickford in two films, Rosita (United Artists, 1923), directed by Ernst Lubitsch (in his first American effort), and Dorothy Vernon Of Haddon Hall (United Artists, 1924), directed by Marshall Neilan. He appeared in the epic film Souls for Sale (Goldwyn, 1923), with a huge cast that included Eleanor Boardman, Mae Busch, Barbara Lamarr, Richard Dix, Lew Cody, William Haines and Aileen Pringle. He most famously played The Evil Associate, sidekick to to Douglas Fairbanks Sr. in The Thief of Bagdad (United Artists, 1924). In 1925 Edwards appeared in Lon Chaney's Phantom of the Opera (Universal). He also appeared in the 1930 Universal "remake" as well: the "remake" was actually a retooling of the original. Universal reissued the original picture and doctored it up with a synchronized musical score, sound effects, some color sequences and added 35% dialog. In the retooling, the film was cut from 101 minutes to 89 minutes - so some actor's moments (not Chaney's or Edward's) were left on the cutting room floor. 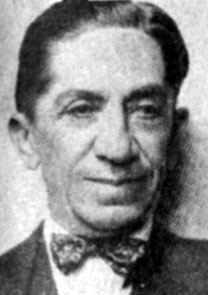 Snitz Edwards joined the Buster Keaton stock company in 1925. Snitz, incidentally, was one of Buster's favorite character men. He supported Buster in Seven Chances (Buster Keaton Productions, 1925). 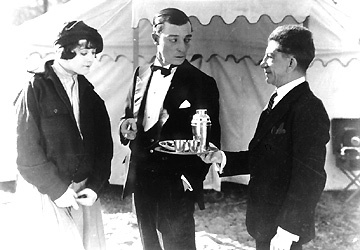 He also appeared in Keaton's Battling Butler (Buster Keaton Productions, 1926), as Buster's faithful valet, and College (United Artists, 1927), as the dean. He also supported Marion Davies in The Red Mill (M.G.M, 1927), directed by William Goodrich (a.k.a. Roscoe "Fatty" Arbuckle). After the talkies took over, Edwards made three more films. 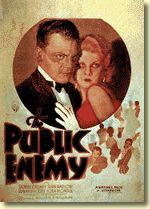 Most notably was The Public Enemy (Warner Bros., 1931), with James Cagney and directed by William Wellman. Although born in Hungary (and named Edward Neumann at birth), Snitz was brought to the United States as a small child. His mother was the daughter of a Hungarian rabbi and his father was reportedly a redheaded polish gypsy. His parents had other children born in the United States. Snitz (a diminutive of "Schnitzel", his family nickname) sold brooms on the streets of New York when he was a youngster, and learned to joke and clown for the customers. He did not have a noticeable Hungarian accent but he did have a quick ear for languages and spoke several fluently, including Yiddish, Spanish and German as well as English and Hungarian. After moving from street performing to Vaudeville, Snitz developed a comedic talent. He traveled extensively with various theatrical companies and met his wife (his junior by more than 20 years) on one such tour. Her name was Eleanor Taylor, an Irish actress originally from Boston and later transplanted to San Francisco. After their marriage, and even after the birth of their first child, Snitz and Eleanor continued to tour. On one trip, the theatrical company was marooned in Panama when the manager ran off with the receipts. The company, including actress Spring Byington, had to make their way across to the Pacific to catch a ship back to California. Snitz and Eleanor had three daughters. 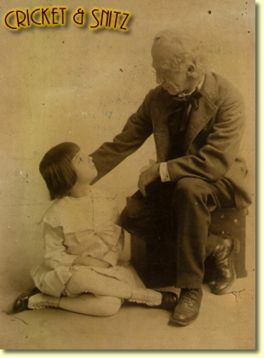 Cricket was the eldest by eight years. My mother, Evelyn, was the middle child and Marian was the baby. All three were put into films. In fact, the entire family made a series of two reel comedies at Universal in the late 1920's, premised upon a theatrical family with three daughters (surprise). My mother always expressed some comedic exasperation that she had to play a bratty ten year old while her younger but more glamorous sister at age twelve and twenty year old Cricket played contemporary teenagers. We have stills from those films showing the entire family. At this time, Snitz was making $5,000 a week, quite a sum before income taxes. The family lived on Wilton Place in Hollywood, and the younger children went to The Hollywood School for Girls, close by the present Hollywood Bowl. My mother remembered playing with little Noah Beery, riding her pony on Sunset Boulevard because her mother thought it was a "quiet, safe country road" and sneaking peeks from the stairs at the parties her parents would throw for the Hollywood set. Snitz became very ill with cirrhosis of the liver and rheumatoid arthritis while filming Public Enemy. He is in the early scenes as "Putty Nose" but then dropped from the rest of the picture when he became too sick to continue. This was the Great Depression, and the family fell on pretty hard times. The big house, the chauffeured car (Snitz never learned to drive) and the cabin in the Santa Monica Mountains all disappeared. He lived for a number of years as a bedridden invalid, but even when his hands became completely crippled, he could still deal a deck of cards with flair. After he died, my grandmother received a flood of visitors who forced handfuls of money upon her, insisting that "Snitz loaned it to me and I just wanted to pay it back." Cricket started working as a secretary at The Jaffe Agency in Hollywood, and became first an agent and, by the time of her death in 1971, an associate film producer at Columbia Pictures in New York where she worked on Born Free, The Victors and The Guns of Navarone, among other projects. Marian went to New York as a young actress, and soon married writer Irwin Shaw ("The Young Lions", "Rich Man, Poor Man", etc.) They lived most of their life in Europe following the HUAC Hearings. Their son is a writer. Marian died in 96 after a late-blooming career as a theatrical producer in France. My mother, Evelyn, went to work at RKO as a story analyst where she met my father, John Humphreys, and freelanced as short-story writers after World War II and into the 1950's. With a young family, they returned to the studios as analysts and, eventually, story editors. My father wrote episodic TV. in the 1950's and my mother became the executive story editor at MGM, and then in New York for CBS before retirement. As small children, my brothers and I can remember going to work with our parents and little old men would come up and pinch our cheeks and say "So, you're Snitzie's grandchildren!" Then they would tell us how they still recalled all the times they'd spent with him. He was a tiny man with a huge personality. *she means me- Anderson Toone, 2nd cuz of Laurel, grandson of Cricket, great grandson of the ol' rascal! 2010 update: Snitz has a new Fan page on Facebook. Join us! !